Total demolition involves taking a building apart while carefully preserving valuable elements for recycling. 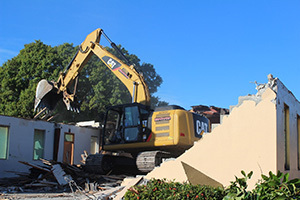 For small buildings, such as houses, that are only two or three stories high, total demolition is a rather simple process. The building is pulled down either manually or mechanically using large hydraulic equipment: elevated work platforms, cranes, excavators or bulldozers. Slab – Slab sawing is the most commonly used diamond cutting method. It is typically used to cut horizontal flat surfaces such as floors, bridge decks, and pavement. Also, called slab saws, flat saws feature a diamond blade that is mounted on a walk-behind machine. Slab saws are typically used to provide expansion joints, remove damaged pavement sections, clean and prepare random cracks for repair, and remove concrete sections for demolition purposes. Walls – Wall saws are typically used on vertical surfaces when a new doorway, window, or HVAC openings are needed. 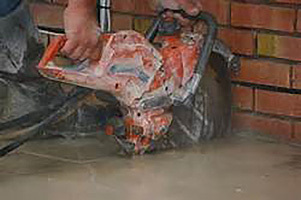 Wall sawing employs a diamond blade on a track-mounted system that can be used for vertical or horizontal cuts. These saws run on hydraulic or electric power. 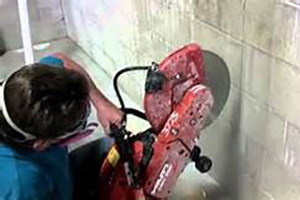 Wall sawing allows for precise cuts in both concrete and masonry structures. 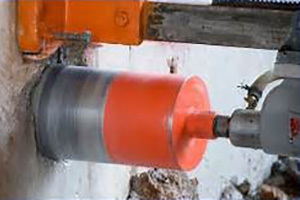 Core Drilling – Concrete core drilling is designed to remove the perimeter of the hole; an annulus of material rather than an entire cylinder of the material being drilled. The material left inside the drill bit is referred to as the core. 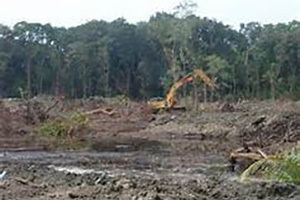 Clearing services include, tree and vegetation removal, grubbing, chipping, mulching, burning, and hauling offsite. The perimeter of the clearing limits will be protected with the proper environmental silt fencing. Selective clearing can be accomplished if there are valuable trees that need to be preserved. 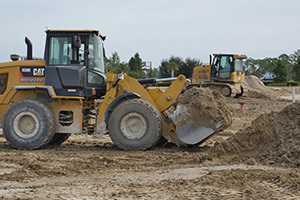 Most projects involve some excavation in terms of lakes, retention ponds, swales, or underground utility installation. Appropriate equipment and expertise are needed to meet the specifications. In some cases there are layers of rock that must be dealt with. 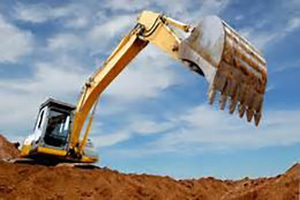 In extreme cases, blasting, hammering, or rock trenching is necessary to loosen the rock before excavation. Bradanna Inc can grade your entire site. Services include rough grading and site balancing, offsite fill, swale grading, lake bank sloping, and final grade for sod. Before a road or parking lot base can be installed, the subgrade must be stable with an adequate Lime Rock Bearing Ratio (LBR). 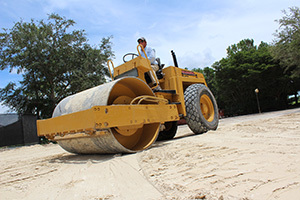 We will prepare the subgrade by stabilizing and mixing it if necessary, bringing it to the proper elevation, and compacting to an optimal density. 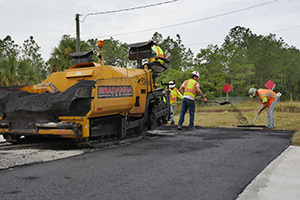 Bradanna Inc has been paving streets, roadways, and parking lots thru out Southwest Florida. We provide new construction and renovation services for counties, municipalities, private developers, and general contractors. Bradanna Inc is a full-service paving and site work contractor, capable of handling both large projects and small repairs with exceptional customer service. If your aging asphalt is beginning to show signs of wear and tear such as potholes or cracking, an asphalt overlay can be used to repair your driveway, parking lot, or roadway. 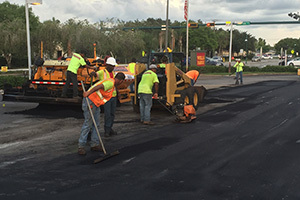 Our team will apply a thin layer of asphalt onto the existing surface. 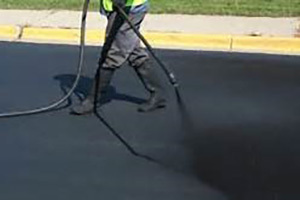 Sealcoating your road surface continually is one of the most cost-effective options to maintain your asphalt. 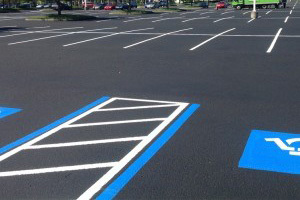 Sealcoating created a type of protective barrier on your asphalt that protects against damage from the sun (a most for Florida roads, driveways, and parking lots), discourages wear, keeps water out, and stops cracks from forming. Painted or reflective thermoplastic stripes, crosswalks, stop bars, stop signs, speed limit signs, crosswalks, reflective pavement markers, ADA handicap mats, and more. Bradanna Inc has specialty crews who install all pavement markings and signs to complete your project. Installation guidelines are dictated by the plan specifications as well as local traffic control ordinances and Florida D.O.T. Design Standard.